A New Website and a New Program to Create a Holistic Business Revolution! 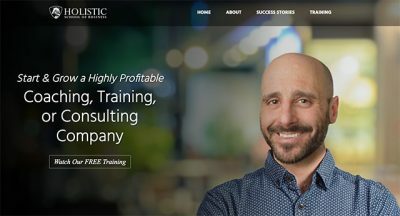 For the past 12+ months, Dharma, myself, and the rest of our dedicated team at the Holistic School of Business have been working hard to create our BEST BUSINESS BUILDING PROGRAM EVER! It was our goal to serve our community in a bigger better way than ever before. To reach this goal, much sweat (and dare I say sometimes tears!) was poured. In the spirit of celebrating, we are so excited to share our BRAND NEW WEBSITE that showcases our new program called Rapid Client Enrollment. It’s a three-month transformational experience that shows you how to scale your heart-centered coaching, consulting or education business to 6 or even 7-figures fast, all while staying true to your life purpose and passion. We are overjoyed by what some of our very first clients to complete this program are saying about their experience. You can pop on over to our Success Stories page to see more testimonials, including in-depth versions of the videos. Personally, when I saw these in-depth testimonials, that’s when I really knew that all the hard work and determination that went into the creation of this program was worth it! Watch our FREE training to learn more about our Holistic Business Revolution TODAY!